More rain is expected later in the day Tuesday but the rainfall isn't expected to be as intense as the storms Monday that caused flooding around the region. Severe storms caused flooding in various parts of the area Monday. Some flooding remained Tuesday. Most major roadways were back open Tuesday. Storms will continue Tuesday afternoon though they likely won't be as severe. 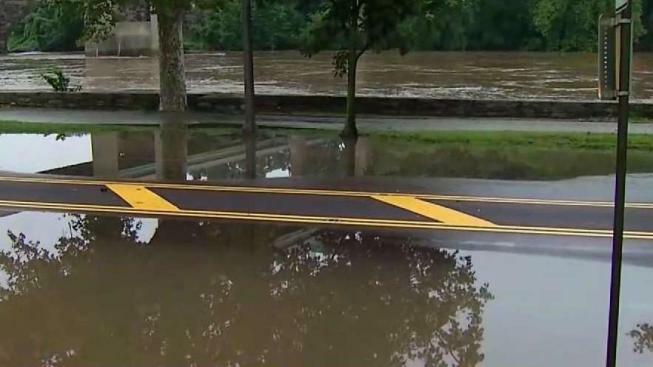 As the water receded early Tuesday, many major roadways in Pennsylvania reopened while a handful remained closed. Route 320 (South Gulph Road) between between Upper Gulph Road/Old Gulph Road and Arden Road in Upper Merion Township, Montgomery County; Limeport Road between Allentown Road and the Lehigh County line in Bucks County; and Darby Paoli Road between Roberts Road and Goshen Road in Radnor Township, Delaware County, remained closed mid-morning Tuesday, PennDOT said. If you see a flooded road, don't try to drive through it. Detours are posted along major roads that are closed. Waves of blinding downpours inundated highways across the region and prompted dozens of car rescues in Montgomery, Chester and Delaware counties, officials said. An Upper Darby police officer responding to flash floods in the area was almost swept away by water. Fortunately he wasn't seriously hurt and was treated at the hospital. Several cars parked along Marshall Road in Upper Darby were covered in water up to their windshields, NBC10 footage showed. Police there fished out passengers trapped inside vehicles. A 13-year-old boy who was swept away by raging water in a Chester County creek had to be rescued by responding crews but also wasn't seriously hurt. Darby Borough declared a state of emergency due to the flooding which prompted evacuations and closures on 13th, 14th and Tyler streets as well as 896 Marin St. and Springfield Road. The Red Cross set up an area for evacuees in the Borough Hall on 1020 Ridge Ave. in Darby. As a result of these dangerous water levels, authorities forced drivers off Interstate 76 at the Route 202 interchange in King of Prussia. Drivers were forced onto emergency access roads. Flood waters also poured into the King of Prussia Mall, closing stores and stranding drivers in the parking garage. I-276 was also closed near Valley Forge. Pennsylvania Gov. Tom Wolf was thankful to the first responders. Rainfall rates during Monday's sudden downpours ranged from 1 to 4 inches per hour. A flood warning remains in effect for the Schuylkill River in Pottstown, Montgomery County. Other flood prone areas could see more flooding Tuesday. •	Limeport Road between Allentown Road and the Lehigh County line. •	Swan Road/Upper Valley Road/Main Street between Green Street and Swan Road in Atglen Borough. •	Lansdowne Avenue/Darby Road/Main Street between U.S. 13 (Chester Pike), MacDade Boulevard and 11th Street in Darby Township. •	Butler Pike/Matsonford Road/Fayette Street between Hillside Avenue and the Interstate 476 Interchange in Lower Merion Township.